I go back home to the Midwest to visit my family every Summer. Since we all hang out nearly around the clock, I usually just stay with my parents, but this year I had the privilege of staying at Hotel Landing in downtown Wayzata, Minnesota. This is the first and only upscale hotel in the area. It’s been fifty years since a hotel has opened around the shores of Lake Minnetonka so needless to say I was pretty excited to be one of the first to experience it! As soon as we pulled up to the hotel, I was wowed by the grand exterior as you don’t see this type of beautiful architecture in Minnesota. The hotel’s arrival in the Twin Cities has been the talk of the town and now I can see why. Before entering the hotel, we couldn’t help but stop and admire the amazing outdoor patio with crisp white curtains, luxurious wood ceilings and outdoor heaters – the perfect set up to dine al fresco on a warm summer night. We arrived pretty late in the evening but were immediately greeted by the friendly staff, a warm atmosphere and fresh flowers in the lobby. I was so impressed with the rooms – especially the Presidential and Supreme Suites. Everything from the design and decor to the spaciousness made it it feel super upscale and also like home away from home at the same time. You feel so comfy and relaxed in the quiet rooms that you really don’t even realize you’re in a hotel. Plush sofas and generous amounts of seating make it so cozy and inviting. This would be ideal for a weekend getaway, girls trip, family vacation or even an all out party in the Presidential Suite. After getting a good nights sleep, it was time to experience all that the hotel had to offer and also explore the quaint town surroundings. Before we headed out, we had breakfast at the hotel’s restaurant Ninetwentyfive which was so delicious. The caramelized banana french toast and cinnamon french toast were out of this world and we couldn’t decide which we liked best. The Nutella crepes were simply AMAZING and paired perfectly with the special in-house coffee blend that hubby couldn’t stop drinking! Milan loved her granola, yogurt and fresh fruit as well. We loved the breakfast so much that we decided to have lunch here every day! The lunch menu did not disappoint and I would highly recommend the arugula pesto grilled cheese sandwich with chips. By far the best grilled cheese I’ve ever had and I’m a pretty picky eater! Milan was obsessed with the chips and was basically all she would eat (lol). 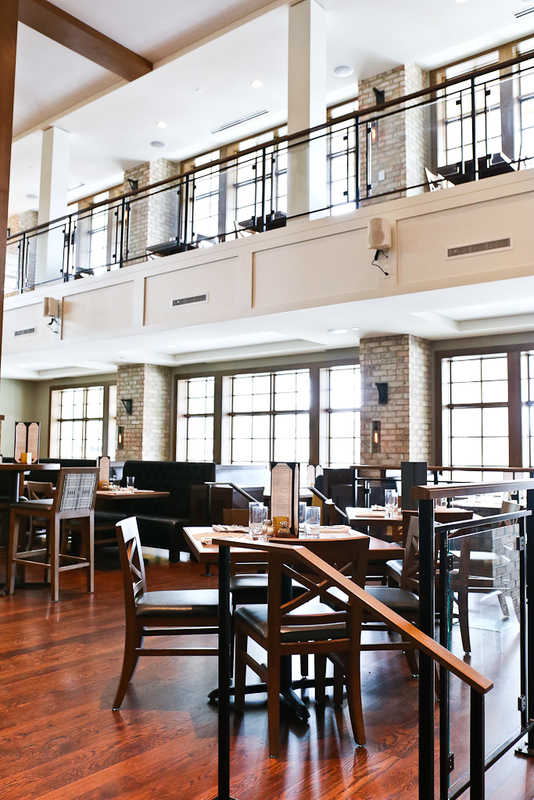 We finally were able to explore all around the hotel in the city of Wayzata which is a highly desirable area located near the shores of Lake Minnetonka. This quaint little town has so much to offer. Tons of shopping, outdoor dining and so many fun activities. You can rent a boat for some fun in the sun on Lake Minnetonka or have bite to eat al fresco overlooking the water at Cov. Make sure to grab a cup of coffee at the cutest Starbucks I’ve ever seen and indulge in some fresh pastries at Bellecour – a new local French bistro and bakery. There are so many cute little boutiques, patios and plenty of people watching to do. There’s also a huge Anthropologie store and Talbots for you to shop at. I love this town! Hotel Landing offers an upscale yet inviting atmosphere. You get the Midwest hospitality (and Minnesota nice) combined with the allure and energy of the Hamptons. This is the perfect addition to the city of Wayzata. I had a wonderful stay and can’t wait to go back! Wow, that place looks gorgeous absolutely beautiful and cozy looking! I would love to go there! It looks so peaceful! Looks beautiful. Thanks for sharing! It was so much fun Liv! Thank you for sharing all the details. It was so fun to experience it through you. I grew up in Minnesota but moved away over 20 years ago. All of our family still resides there so we visit once or twice a year. We always stay with our parents but it is good to know a nice hotel exists if the need arises. It is nice to hear you were well taken care of???? Thanks Kathy! OMG what part of MN are you from? It was definitely weird not staying with my parents when I’ve been staying with them every year since I’ve moved away. We really enjoyed our stay and will most definitely go back next time! I grew up in Buffalo (my parents still live there) and my in laws live in Plymouth. It is easy to go between since they live only 40minutes a part! We’re planning a trip in the Fall and staying at the Hotel Landing for our anniversary – I’m so excited about it and thrilled you posted all these pictures as their website didn’t show nearly enough of them! Your pictures are amazing and now I’m even more excited for our trip. THANK YOU!!! Hi Amy! Aw happy anniversary! You are going to love it! Not sure if you are from MN but I love Wayzata. So much to do and the hotel is stunning! We’re from the Mid-West (Missouri) but its our first trip to MN – we wanted to see Minneapolis/St. Paul area but wanted to stay somewhere pretty yet not to far from downtown if we venture to that area – Wayzata seemed perfect! Looks so charming – thanks for the wonderful post! Looks amazing! It sounds like you had a great time too. Beautiful post. I live in St Paul and have only driven past Wayzata once but now you make me want to explore it. OMG it’s the cutest little town! You must go explore!